Last time we looked at how to count the parts of a polyhedron, and a mention was made of Euler’s Formula (also called the Descartes-Euler Polyhedral Formula), which says that for any polyhedron, with V vertices, E edges, and F faces, V – E + F = 2. We should take a close look at that simple, yet amazing, fact, and some often-misunderstood cases. I have to find Euler's formula for two-dimensional figures and explain it at a university level and at an elementary-school level. 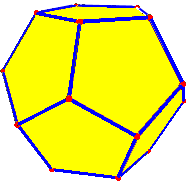 For both the dodecahedron and the graph, V = 20, E = 30, and F =12 (including the “outside”), so V – E + F = 20 – 30 + 12 = 2. First, go through a bunch of simple examples where the kids can count vertices, edges, and faces, and verify that V - E + F = 2. Or maybe start with four or five examples where you don't even calculate V - E + F, but just make a table of those values. Then have the kids look at the table and look for patterns. You should be able to lead them to show that the above sum/difference is two by noticing things like the fact that if V or F goes up, so does E.
Next, after they've guessed the formula (with or without your help), try making some more drawings to test the formula. What I would do here would be to draw a new configuration, count the items, and check it. Then make the item a bit more complicated by adding vertices in the middles of edges and by adding edges that connect two existing vertices (or make a loop from a vertex to itself). You're doing this to secretly convince the kids that arbitrarily complex connected configurations can be made from simple ones by adding vertices to edges or edges connecting existing vertices. Finally, for the proof, show that it's true for a single vertex in the plane (V=1, F=1, and E=0). Next show that if you have ANY configuration, adding a vertex to an edge increases V by 1 and E by 1, leaving V - E + F the same, and that adding an edge between two vertices increases F by 1 and E by 1, again preserving the Euler characteristic. So you have a trivial situation where the formula holds, and two operations that are guaranteed to preserve the characteristic. Finally, begin with the dot on the plane and show how to construct a few of the examples you've already done one step at a time. A university-level proof, of course, would use terms like “induction”, and would prove that any appropriate graph can be produced this way. Perhaps this isn't a rock-solid mathematical proof, but it should certainly be enough to convince the kids that the theorem is true, and shows them (in a secret sort of way) the ideas of mathematical induction and the idea of using an invariant for a proof. I might even end by showing that exactly the same formula holds for a 3-D cube and an assertion that the formula is also true in 3-D, to give some of the brighter kids something to think about and play with. How and why does Euler's rule work for cylinders? A cylinder is not a polyhedron, but if you “blow it up” you will still get a spherical form, so the formula ought to work. Yet a naive approach to that fails. Students often see the cylinder as having three faces, two edges, and no vertices. (I’ll be discussing how these terms apply next week!) But taken that way, V – E + F = 0 – 2 + 3 = 1, which doesn’t work. I’ll be getting to that later. I suppose you mean the formula  V + F - E = 2. 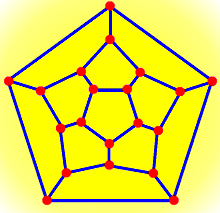 A simple example is a cube, which has 8 vertex points, 6 faces, and 12 edges, so 8 + 6 - 12 = 14 - 12 = 2. The faces of a cube are flat, but this would also work if the faces or edges were somewhat curved, just so long as they don't intersect each other. The reason I mention this is that in the case of a cylinder, one of the faces will be the curved part of the cylinder. Let's concentrate first on that curved face, because that is the "secret" about interpreting Euler's Law for a cylinder. If you examine a 'tin can', common as a food container, you will see that there is a 'seam' from bottom to top. That seam counts as an edge for the purposes of the formula. Also, that edge has a vertex at each of its ends. We’ll see below why the seam is needed! When we close up the cylinder 'tin can', the top is a circular face, with an edge around its circumference, and the same for the bottom face. Here is a list of all the faces, edges and vertices. 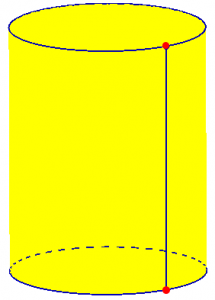 Face 1 = the curved surface around the cylinder. Edge 3 = the circle around the bottom face. Note that the two vertices also serve double-duty as the points where the circular edges start and stop. I need to know how many faces, vertices, and edges do cylinders, cones, and spheres have? Logically I would say that a sphere has 1 face, 0 vertices and 0 edges. Problem:  a face is flat, sphere is not flat. Secondly this does not satisfy Euler's formula v - e + f = 2. I would say a cone has 2 faces, 1 edge, and 1 vertex. Problem:  while this does satisfy Euler, it does not satisfy the definitions. Properly speaking, Euler's formula does not apply to a surface, but to a network on a surface, which must meet certain criteria. The "natural" faces and edges for these surfaces, or those determined by applying the definitions used for polyhedra, do not meet these criteria. So it does fit the formula; but there is no reason it should, really, because it doesn't fit the requirements for the theorem, namely that the graph should be equivalent to a polyhedron. Each face must be simply connected (able to shrink to a disk, with no "holes" in it), and likewise each edge must be like a segment (not a circle). One of our "natural" faces has a "vertex" in the middle of it, so it is not simply connected; and the "edge" has no ends, so it doesn't fit either. These errors just happen to cancel one another out. It doesn't work, and the theorem doesn't claim it should. In each case you can "fix" the graph by adding one segment from top to bottom. 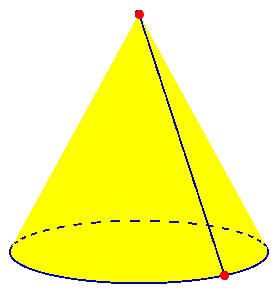 In the cone, this gives one extra vertex (on the base), and one extra edge, so the formula still holds. In the cylinder, it gives two new vertices and one extra edge, and the formula becomes correct. Here V = 2, E = 2, F = 2, so V – E + F = 2 – 2 + 2 = 2. We saw Doctor Mike’s “seam” above, where V = 2, E = 3, F = 3, and V – E + F = 2 – 3 + 3 = 2. What do you have to do to "fix" the sphere? I left this to Cara. The answer is that you can draw any polyhedron you like on the sphere; or, to keep it minimal, you can just make an “equator” and put one dot on it. Now we have V = 1, E = 1, F = 2, and 1 – 1 + 2 = 2. 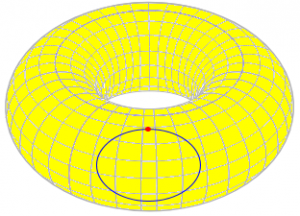 Can you explain why Euler's characteristic is zero for a torus? If, for example, I drew an arc with two vertices on top of the torus and connected another arc to it to form a circle, wouldn't V=2, E=2, and F=1, so that V-E+F=1? What I am I missing? Isn't this an admissible graph? 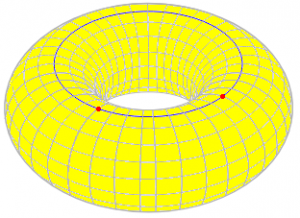 Your mistake is that one of the "faces" includes the "hole" of the torus, and therefore is not a valid face. A face must be topologically equivalent to a disk; you should be able to flatten it out into a plane. If this doesn't clear it up, please write back and give me the definition you are using of an "admissible graph," so I can use the same terms you are familiar with - there are several ways to describe this. Thanks for the reply. Actually, the term "admissible graph" comes from Steven Krantz's book, _Techniques in Problem Solving_. He defines it simply as a connected configuration of arcs and his example focuses on a sphere. He also defines a face as any two-dimensional region, without holes, that is bordered by edges and vertices. One of his problems is to determine the Euler characteristic for a torus and to show that it will work for any admissible graph on the torus. So let's say you drew two arcs on top of the torus so they formed a circle around the torus (it would look like three concentric circles if you viewed the torus from the top with the hole looking like one of the circles). What is F for this configuration? 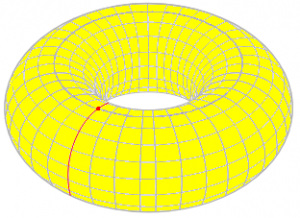 Also, if you drew one arc from the outer "edge" of the torus to the hole and back up and around (this would sever the torus if a cut was applied along  the arc), what is F for this configuration? Is F always zero for a torus? If so, why? I guess my real problem is that I don't understand how Euler's formula applies to a torus. I understand how it applies to figures with pointy edges like a cube, pyramid, etc. Maybe a good comparison to a torus is a nut (square with a hole in the middle). In this case, would F=4 because two of the six sides have a hole and therefore do not count as valid faces? I've found that just about every place I look for a definition of the Euler characteristic and related concepts is either too vague (as yours is), or too deeply embedded in topology (and dependent on definitions given elsewhere, or perhaps never clearly stated) to make a good reference to answer questions like this. The general idea is simply that either we are making an actual polyhedron that is topologically equivalent to, say, a torus, or we are making a graph on the surface that is "polyhedral" in a topological sense. But exactly what this means is seldom stated. Nothing is wrong if things are precisely stated. does qualify (a torus would not). 2. It only applies if all faces are "like"
3. It only applies if all edges are "like"
This is good enough to answer your specific question. Your edges are valid; but your single "face" is not equivalent to a disk; if you cut along the edges and spread it out flat, it becomes an annulus. That's the problem. This is true of both of Jim’s attempts; they can also be described as “tubes” (the lateral face of a cylinder); the second especially is best seen that way. There are several ways in which a "face" may fail the test. One kind of "hole" is that in your example, where the "face" is like an annulus or cylinder; its set of edges is not connected. In your example, the inner and outer edges of the annulus are glued together when you put it on the torus, but they are distinct when you view the "face" by itself. It is easy to miss this! You must picture taking the "face" off the surface, so you can see what it really is. Another way is for the "face" to have only one edge, but have a hole in the same sense that the torus has a hole; this is what happens if you simply draw a circle (with one vertex to make it a valid edge) on the side of the torus, so that the inner face is a valid disk, but the outer "face" is all the rest of the torus, including the "hole," which you can also picture as a "handle." This can't be flattened out at all. Here V = 1, E = 1, F = 2, so V – E + F = 2, rather than 0; because the second “face” contains the “hole” of the torus, the graph could just as well be on a sphere! In either case, the "face" is not simply connected; you can draw a circle in it that can't be shrunk to a point. The problem in the definition you are using seems to be that he defines an admissible graph without reference to the faces, which really are the determining feature in this context; and perhaps also he has not clearly defined what he means by a "hole" in a face. If you remember that this can mean either a hole with an edge, or a "handle," it might be clearer.